In the last 6 months, we’ve helped more than 100s of folks improve their interview skills to break into consulting. 1. They don’t sell themselves enough. We’ve never worked with a person who we thought oversold us – that should tell you something. Out of 5 questions where they have an opportunity to describe their strengths, they’ll miss 4 of them. 2. They don’t provide a clear roadmap and upfront structure. Structured interview responses are a skill we’ve harped on over and over again. 3. They give accurate, albeit generic, responses. Unless you’re the cream of the crop, simply checking the right boxes isn’t enough. You need to be distinctive in interviews to be remembered, and to stand a chance of receiving the offer. It requires taking risks. In this article, we’re going to describe 8 common fit questions and the mistakes that we’re hearing in these practice sessions over and over and over. 1. Please take a minute and run me through your consulting resume. Focusing on too much trivial crap. This crap includes: extracurricular activities in your freshman year of college; summers spent backpacking and hiking through Europe and Latin America; where you were born and raised. 2. What do you think makes a good management consultant? -What skills are needed to succeed in strategy consulting? Missing the opportunity to promote yourself! This question really has 2 parts to it: one, describe the skills and qualities of a rockstar business consultant. Two, show me that you possess and/or have demonstrated those skills in prior experiences. 3. Have you dealt with a difficult boss? If so, explain how you managed the situation. If not, explain how you’d deal with a hypothetically difficult boss. -Have you disagreed with your manager? How did you resolve the conflict? -Explain a situation where you worked under someone you didn’t like or get along with. How did you address the situation? Giving the “we talked about the problem honestly and as a result everything became much better” explanation. This answer is bad for several reasons: one, everyone gives that answer. Two, no one really believes it. Three, it doesn’t give any insight on the actual communications and mechanics that resolved the situation. This is where the best interviewers really separate themselves. 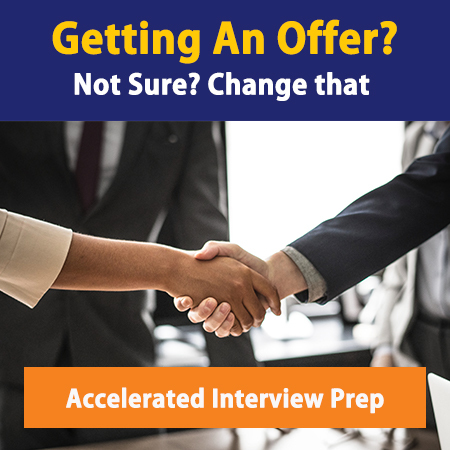 They prepare for interviews well ahead of time, really working out the specifics to tough questions like these – while still delivering the responses in a natural, conversational manner. To answer this question well, you’ll need to craft a good response. Get specific about the conflict issues, about your viewpoints and those of your boss’s, and exactly where compromise was achieved. It’s ok to admit partial failure. It’s also ok if you’ve never been through a situation like that. But in your hypothetical scenario, an equal amount of hypothetical detail should be provided. -What’s your biggest developmental need in a work enviornment? -In feedback from prior managers, where did they say you needed the most improvement? Giving a “strength disguised as a weakness”. Don’t do it, please. Be genuine in your response and describe a real weakness. Unless you say that you’re lazy and don’t enjoy coming into work, you should be fine. General advice here: include a specific anecdote (as mentioned in my earlier post on common interview mistakes) and describe 1-2 big personal takeaways from your experience. 5. Describe a scenario where you lead a team in the face of a major obstacle. -When have you lead a team through a big challenge? Too often, people forget that the point of this question is to highlight your TEAM and your TEAMwork abilities – not to highlight your personal awesomeness. The best responses to this question frame your role as a facilitator. You proposed an idea that broke the impasse; You pushed the team out of its lethargy and into action. The conflict and resolution should always be framed in the context of what the team together accomplished. 6. Why do you want to work at McKinsey? -What interests you about Bain? -Why BCG over any of the other firms? Mentioning the people is fine. It’s a safe component of a good answer. The problem is not mentioning any specific anecotes, encounters, or qualities that would be unique to the firm in question. 7. For experienced hires: What motivated you to change careers now? -Why are you interested in transitioning to management consulting? -Why strategy consulting now, after X years in Y industry? Being overly negative when discussing your former industry and career. In fact, I think the best responses avoid direct criticisms altogether. When you’re too negative, interviewers will wonder 2 things: one, if you hate it so much what took you so many years to switch careers; two, if you’re that pessimistic and unhappy, couldn’t the same change happen to your current perspective on strategy consulting? 8. What company do you think is having a tough time right now, and what would you recommend they do to improve their current situation? The 8 questions above, and variants on them, will make up at least 50% of the questions you’ll face in the behavioral part of a consulting interview. Practice your own responses, avoid these mistakes, and you’ll be well on your way to becoming a management consultant!